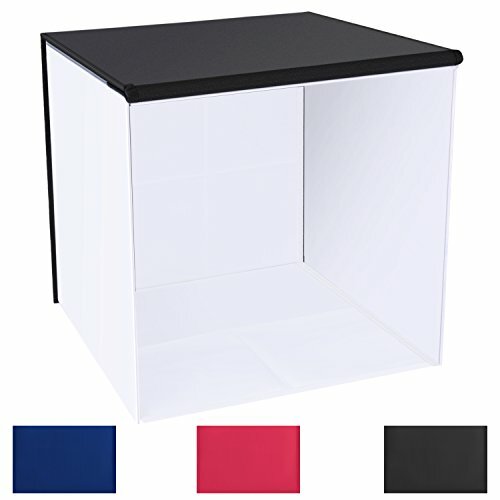 This Neewer 20"x20" Photography Studio Light Box/Tent would be a great addition to your studio. The light tent, which can be used by amateur and professional photographers, makes it easy to take professional digital photos of products and items. It is ideal for photography lovers, and collectors. Not only does the material of the tent provide a background for the subject, but it also filters the light from the source, creating a very even, almost shadow-free light across objects inside the tent. This helps to decrease harsh shadows and reflections on shiny objects, such as metal or glass, and gives a clean, crisp backdrop to all items. Its special nylon fabric diffuses the external light, softens shadow, and reduces glare to create the perfect result. Light tents work well with both film and digital cameras. Be sure to adjust lighting as needed.